You can expect lasting dependability and plenty of great features in the 2018 Fleetwood Discovery RV. The 2018 Fleetwood Discovery RV in TX is a Class A Diesel RV that your family is sure to love in three great floor plans: 38K, 38F, and 36N. 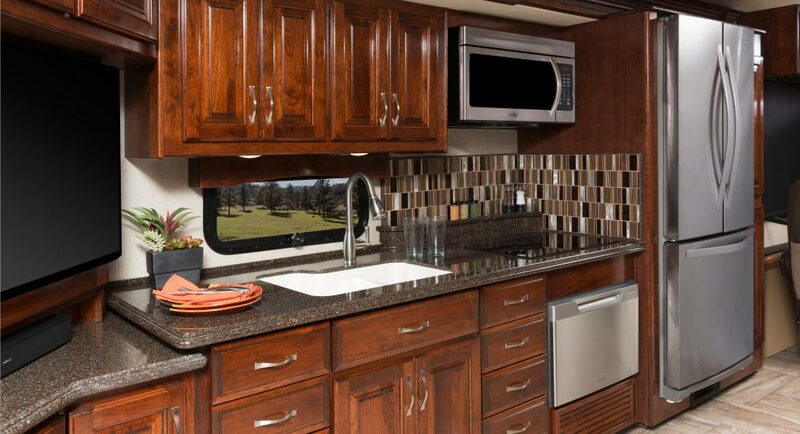 You can count on the 2018 Fleetwood Discovery RV to be your home away from home with many great features and amazing amenities. The 2018 Fleetwood Discovery RV near Texas for sale comes in four great color themes: Crimson, Infinity, Saddle, or Vision. Hurry to your favorite dealer, Ancira RV Boerne to find out more about the 2018 Fleetwood Discovery RV today! The 2018 Fleetwood Discovery RV Texas for sale near me offers great additional features you can equip like an L-shaped dinette, 95-inch by 70-inch sofa, or exterior entertainment center that includes a 48-inch LED TV, only at Ancira RV in Boerne. Hurry to your trusted Ancira RV in Boerne has to offer you and your family today! 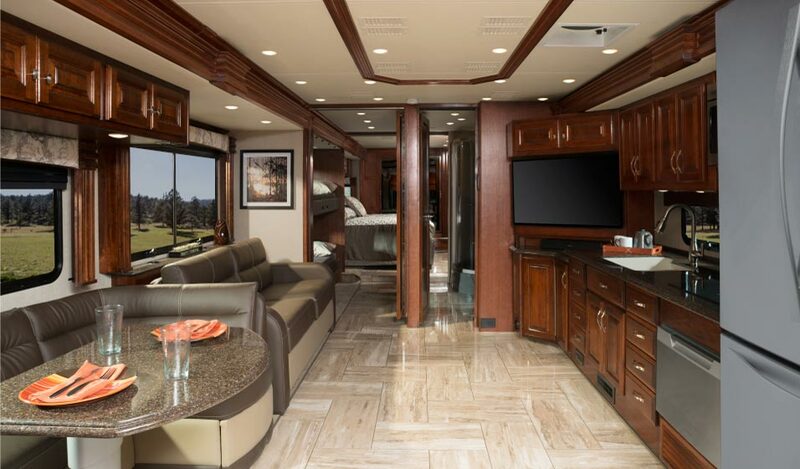 No matter which model of the 2018 Fleetwood Discovery RV in Texas for sale you choose, you are in for a comfortable and enjoyable trip with awesome features like a King bed, nice bathroom with a tile shower, and two swivel seats in the front for the driver and passenger. Not to mention driver convenience features in the LXE model of the 2018 Fleetwood Discovery RV for sale that includes awesome features like cruise control, dual dash monitors, or a convenient power entry step cover. Come visit us at your friendly 2018 Fleetwood Discovery RV in TX Dealer in Boerne, TX to pick your favorite internal color themes between Celestial Reflection or Time Square. And for the cabinets, you can choose between Nottingham Cherry High Gloss or Autumn Wheel High Gloss. The LXE model of the 2018 Fleetwood Discovery RV for sale boasts amazing features that will make you feel at home like a Bose Sound Bar, LG BLue-Ray/DVD player, a residential refrigerator with 22 cubic feet, dishwasher, and 32-inch LED HDTV. You will also fine a glass shower door, LED lighting over the sink, and beautiful tile backsplash. Visit us at your friendly Ancira RV in Boerne to see what else this model of the 2018 Fleetwood Discovery RV, Texas. The 2018 Fleetwood Discovery RV for sale near me can hold up to 100 gallons of fresh water holding tank, as well as 100 gallons of fuel. The 2018 Fleetwood Discovery RV, Texas comes standard with a 340 HP engine with a 6-speed transmission, or you could opt for the Optional 360 HP engine. Stop by your favorite Ancira RV in Boerne, TX to test drive one for yourself! Overall Height (with A/C): 12' 10"
Come visit us at your friendly 2018 Fleetwood Discovery RV Dealer in Boerne, Texas to pick your favorite options to add to your RV like a drop down queen bed, free-standing dinette with credenza, or a facing dinette. With so many awesome accessories to choose from, you'll have a hard time picking your favorite! The 2018 Fleetwood Discovery RV, Texas is ready for your road trip! Visit us to see what the 2018 Fleetwood Discovery RV has to offer you! Come get yours at your trusted Ancira RV in Boerne TX located at 30500 IH 10 West, Boerne, Texas 78006. You can also reach us at (830) 981-9000 for more information on the 2018 Fleetwood Discovery RV for sale today! Contact dealer for full details on the 2018 Fleetwood Discovery RV in Texas for sale, check owner's literature for full vehicle and warranty details.